This memorial is dedicated to veterans of wars from Macon and Bibb co. on the occasion of the 50th anniversary of the American Legion. It was repaired and reworked in 1993 with funds from American Legion. 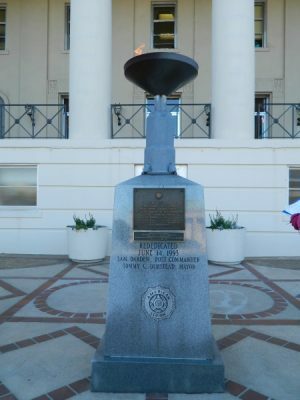 The eternal flame burns on the Poplar Street side of the City Hall building at the foot of the two grand staircases that flank the building's white-columned portico. In 1837, city hall was built as headquarters of the Monroe Railroad and Banking Co. before serving as the seat of government for the city of Macon. During the Civil War, it was a military hospital. Its greatest notoriety during the civil war came in November 18, 1864, when Governor Joseph E. Brown, fleeing the Union army's advance into Milledgeville, moved the state capital to Macon and set up an office at City Hall. The General Assembly met in the building the following February and March, the last legislative session under the Confederate States of America. The building ceased to serve as capitol on March 11, 1865 . Two city council chambers are located in the building. The Eternal Flame commemorates the building.